In We’re No. 1, The A.V. Club examines an album that went to No. 1 on the Billboard charts to get to the heart of what it means to be popular in pop music, and how that concept has changed over the years. In this installment, we cover USA For Africa’s We Are The World, which went to No. 1 on April 27, 1985, where it stayed for three weeks. Released April 23, 1985, the We Are The World album spent three weeks at the top spot of the Billboard 200, sandwiched between runs for Phil Collins’ No Jacket Required. It reached that position on the back of the titular single, which moved over 20 million copies and raised millions of dollars, while looping in a veritable murderers’ row of the biggest names in pop music at the time: Diana Ross, Billy Joel, Huey Lewis, and Paul Simon, to name just a few. It won four Grammys the next year: Record Of The Year, Song Of The Year, Best Duo Or Group Vocal Pop Performance, and Best Short Form Music Video, sort of like a less obnoxious ’80s version of “Same Love.” We Are The World is an album, but only in the technical sense of the word—it’s a collection of songs released and packaged together under one umbrella as a long-playing delivery system for the story of its lead single, opening song, and title track—the first ever single to go multi-platinum. And yet it’s not like “We Are The World” is even a particularly good song—it swings far too hard for the fences for that. It’s difficult to imagine anyone choosing to listen to it of their own accord as a pop song, even in 1985. Its unwieldy length (over seven minutes) is necessary to accommodate all of the stars with vocal solos. Given the number of cooks in the kitchen (and consequent egos to placate), its over-reliance on collective star power and subsequent generic quality is understandable. Some of the soloists do manage to imbue the repetition of the chorus with feeling, particularly Stevie Wonder and Bruce Springsteen, but they are the exception rather than the rule. Besides, the musical content of “We Are The World” (and We Are The World) is irrelevant to its success. Writing for the Los Angeles Times between the release of the single and the album, Robert Hilburn describes the session that produced the track as “nothing short of a pop miracle.” Befitting an impossible, nigh-religious event, the most important thing about “We Are The World” is its creation myth. The germ for the session single originated in, essentially, a very ’80s-appropriate competition to see which country could raise the most money for charity. Singer and activist Harry Belafonte conceived of the track as a response to the charity single “Do They Know It’s Christmas?” by Band Aid—a supergroup of British artists that included Sting, Paul McCartney, and David Bowie—to support the victims of a famine in Ethiopia. “Do They Know It’s Christmas?” set the template for “We Are The World” in more ways than one: Not only was the single recorded by a collection of a country’s biggest pop stars, trading on their fame to sell the music—it’s also horribly condescending and self-aggrandizing. After Belafonte got the idea to do an American version of Band Aid, he roped in Lionel Richie and Kenny Rogers to put the band together, something that got markedly easier once Michael Jackson expressed interest. Writing for The Awl, Mike Barthel describes the successful grouping of the artists who would take the moniker USA For Africa as the expenditure of Jackson’s artistic capital from Thriller, its attending video, and the striking performance of the moonwalk. 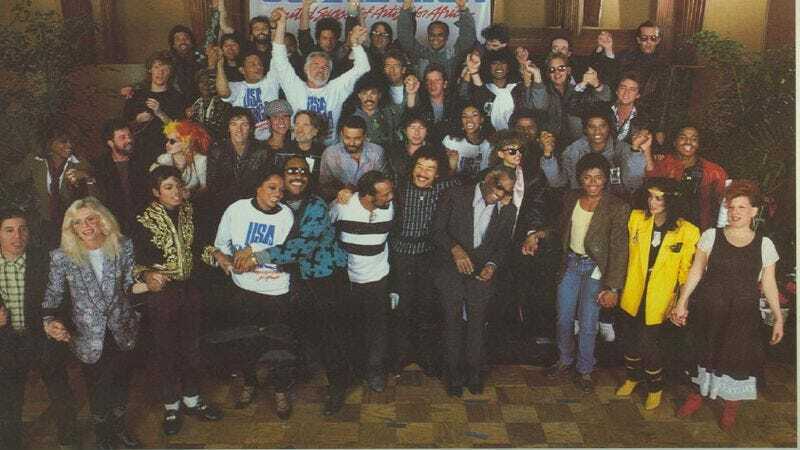 Jackson co-wrote “We Are The World” with Richie and, from his spotlights in the “We Are The World” video, it’s easy to see how much he cared about its success. The USA For Africa architects used the American Music Awards as an excuse to get everyone together and carefully planned the recording in a marathon, all-night session that also produced the iconic music video. The session has been mined for anecdotes and interpretations like a holy text, including a 50-minute documentary narrated by Jane Fonda. In the documentary and elsewhere, most of the backstage accounts of the making of “We Are The World” focus on either the many obstacles to recording (the session almost collapsed over a line written in Swahili, a conflict that was only resolved by literally bringing in Ethiopian women to thank the stars) or humanizing instances of levity related to these same problems—say, Willie Nelson and Waylon Jennings laughing over their shared protest of the song’s original key, which was too high for many of the male singers. The duo emphasis on the difficulty of the recording and insistence that USA For Africa had fun doing it in the retellings of the myth tries to simultaneously undermine and legitimize the intense self-seriousness of the enterprise—Quincy Jones sent the vocal guide to everyone with a letter that, in part, read: “In the years to come, when your children ask, ‘What did mommy and daddy do for the war against world famine?’, you can say proudly, this was your contribution.” The members of USA For Africa were doing something good in the world, something heroic, by showing up at a studio after an awards show and playing nice with other big personalities. Hilburn is right to describe this as a miracle, but its implausibility says something more depressing than inspiring. After the single and its attendant pageantry came the somewhat less-glamorous business of putting out the full record—which helped contribute to the now over $60 million We Are The World has raised—a month after the single’s release. Has anyone ever listened to any of the rest of the songs on We Are The World? Do most people even know there’s a full album to go with the single? Does anyone who still owns the album even remember any of the other tracks? For a No. 1 album, it’s awfully anonymous. The second most notable track on the album is “Tears Are Not Enough,” a charity single by yet another supergroup, this time a collection of Canadian artists recording under the name Northern Lights. The band included Joni Mitchell, Bryan Adams, Neil Young, and Geddy Lee, but its star power wasn’t nearly at the level of USA For Africa. (There’s probably a joke to be made about the Canadian supergroup’s song being released as part of the American artists’ album.) Like the rest of the album, “Tears Are Not Enough” tries to soar more out of a sense of obligation than any real musical impulse. Even Prince’s “4 The Tears In Your Eyes” doesn’t fully escape the easy allure of the moral high ground—for as inclusive as Prince’s funk can be, it’s still a little tough to swallow his cries that the meek will inherit the earth. Instead, the high points of We Are The World are decent, still mostly forgettable songs like The Pointer Sisters’ “Just A Little Closer”—a fun, if not particularly interesting, R&B cut—and Tina Turner’s slow-burning cover of The Motels’ “Total Control.” The album’s best cut—Bruce Springsteen’s live rendition of Jimmy Cliff’s “Trapped”—works because, in contrast to the rest of We Are The World, it’s deeply specific. The song’s narrator is the one who’s “wearing the same old chains,” rather than a faceless mass—he’s channeling one person instead of millions, which is what renders most of the album devoid of personality. But how much did We Are The World actually do for those millions? In the same way the collective nature of “We Are The World” prevents it from being a real jam, the song (and the movement it tried to create) is hamstrung by the contradictions at its core. It couldn’t really critique any of the institutions and deeply ingrained systems that contributed to the problem it was ostensibly trying to fix because all of the artists were and continue to be deeply embedded within them, so that even though it did some good, the funds raised function, at best, like a band aid (or Band Aid). There’s no denying it had some positive effect on the people it was written to help ($60 million is a big number), just maybe not the effect everyone would have liked (or imagined). The charitable effect of both “We Are The World” and We Are The World is, again, incidental to the album’s importance. What makes the song so striking today is its creation of a now-impossible monocultural event that is not only musical, but moral. We Are The World makes a statement of identity—“We, the assembled pop stars and any listeners identifying with us, are the same as starving Ethiopians”—but that identity is defined by homogeneity in pursuit of feel-good, semi-ethical sameness. Musicians from Kenny Loggins to Cyndi Lauper, from Stevie Wonder to Bob Dylan, all came together to do something “good.” Everyone listening in got to feel like they, too, were doing their part, even if that was just tuning in on the radio or buying the new Michael Jackson single. Our collective awe at the way everyone collaborated on the track signals that just being in the room was an important show of character for the USA For Africa musicians, just as listening to it is an important show of character for us. Rather than selling music, or even the lifestyle that might be represented by music, the creation myth of We Are The World sells the idea of making listeners feel like they’ve overcome something by listening (any good they really do is incidental). We Are The World is important, then, primarily for what it represented, and the trends it presaged—though perhaps not quite at the same scale, the charity album as a concept is a miracle no longer, and one doesn’t have to look far to find examples of this basic sort of cultural exchange. A re-recording of the single featuring, among others, Justin Bieber and Miley Cyrus hit No. 2 on the single charts in 2010. For better or worse, “We Are The World” succeeded, though perhaps not at what it was originally trying to do.